"Let the child imbibe in the full spirit of play. There is nothing like it to keep him on the path of health, right thinking and mind development." That is the guiding purpose of the author. The reader will find in this book a collection of old and present day games. The student of Play has long realized that there are no new games, that all our games of today are built on the old timers. 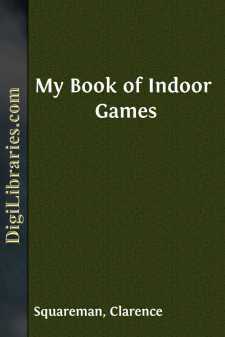 The purpose of My Book of Indoor Games is to furnish amusement, entertainment and to be the means of sociability. So very often the question comes up—"What shall we do?" In many cases this book serves only as a reminder, the games and parlor tricks are well known but cannot be recalled at the critical moment. A combination, such as this, of the best of the old-fashioned games and a carefully compiled list of the games of today will furnish much help to the young in their search of entertainment and amusement. But the book will be equally useful to grownups. The author has seen staid, respectable people play "Lubin Loo" with as much zest and spirit as the youngest group of children. All of us have played "Going to Jerusalem." The spirit must be there; there is nothing so contagious as the spirit of play. This is a game which almost any number of children can play. The players seat themselves in a circle, and each takes the name of some town, or flower, or whatever has been previously agreed upon. One of the party stands in the middle of the circle, with a small wooden trencher, or waiter, places it upon its edge, and spins it, calling out as he does so the name which one of the players has taken. The person named must jump up and seize the trencher before it ceases spinning, but if he is not very quick the trencher will fall to the ground, and he must then pay a forfeit. It is then his turn to twirl the trencher. A very similar game to this is "My Lady's Toilet." The only difference is that each player must take the name of some article of a lady's dress, such as shawl, earring, brooch, bonnet, etc. To play this game it is best to sit in a circle, and until the end of the game no one must speak above a whisper. The first player whispers a question to his neighbor, such as: "Do you like roses?" This question now belongs to the second player, and he must remember it. The second player answers: "Yes, they smell so sweetly," and this answer belongs to the first player. The second player now asks his neighbor a question, taking care to remember the answer, as it will belong to him. Perhaps he has asked his neighbor, "Are you fond of potatoes?" and the answer may have been, "Yes, when they are fried!" So that the second player has now a question and an answer belonging to him, which he must remember.